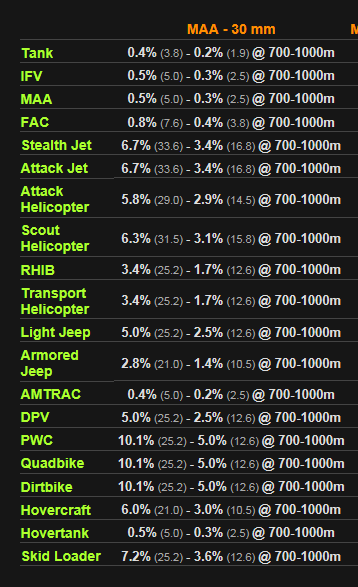 BF4 vehicle section has been finally updated (replaced) from super old data to new, up-to-date and accurate damage table. On older site damage values didn't take into account certain mechanic in game data and thus one couldn't say for sure what the actual damage was. edit: And the damage values vs infantry? Not updated yet, altho damage is one of the biggest factors (maybe RoF should be mentioned). Can you tweet this and stuff? "yet"? So we can expect it soon(Â)? I'm thinking damage drop-off distance should be on a second row. This would reduce the amount of reading in one line. Right now, I think this looks a cluttered. I am also thinking a toggle from raw damage into DPS might help with the majority of users. Yeah I couldn't really decide what would be the best way putting the dropoff thing. I tried different styles and for some reason left it with "@" but could change it to go to second row. How about removing the "raw damage" completely (people don't see the vehicle healths so doesn't make much sense) and replace it with relative-DPS (ie. how much ingame dmg dealt per second)? I think an Advanced Section would be fine (or even a link to the weapon's data file!) for showing the raw damage. would look a lot better. And as for DPS, gonna have to multiply damage of the projectile by the long term number of projectiles per second which is probably going to have to combine RateOfFire, ReloadTime, OverHeat, and AutoReplenishDelay where applicable. I think I am going to make a selection for which values you want to see (new dropdown box where you select either relative dmg, raw dmg or DPS). Would indeed be much clearer. Where are the smart rocket stats for the AH? Can more canister (both for MBT and IFV) information be added? Such as number of pellets. Otherwise the information isn't too useful. Also, is it possible to add in one more row for damage against infantry? I think damage vs infantry needs to be included, especially since things like the IFV LMG only do damage against infantry.